This packet contains "Super You" award certificates. 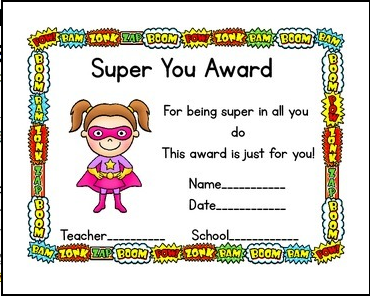 Perfect for giving to your students at any time during the year. Graphics provided by www.pinkcatstudios.com. Did you know that you can get credit for future TPT purchases? It's as easy as providing feedback for the items you have already purchased. Simply click on the provide feedback button next to your purchases then rate the product and leave a short comment. You receive 1 TPT credit for each dollar you spend. 100 credits equals $5.00 and can be spent just like cash on your future Teachers Pay Teachers purchases. To keep up with my new items simply follow me and you will get notified when I post new things.